The popular brand Saffola had challenged a contest on cooking with Oats. 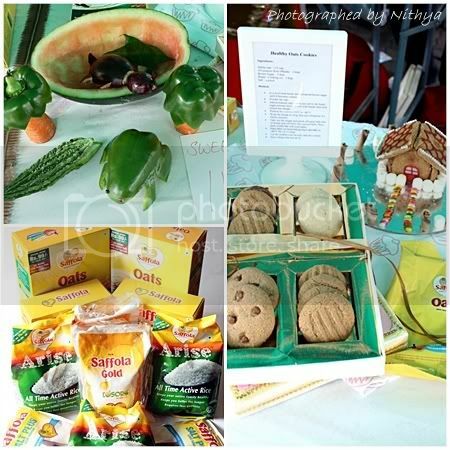 The contest comprised of a quick quiz on oats as the first round, slogan writing contest as the second, a 10 min vegetable carving contest as third which was followed by the display of our prepared oats dish. True to the saying, I have always tried only to give my best in what I do and don't expect the results. Won the first place for vegetable carving and first under the oats sweet category. And my slogan "Vote is for a healthy nation! Oats is for a healthy human!" won the third place too. 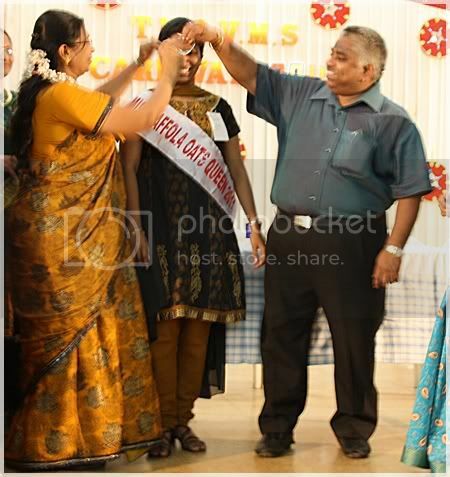 I also bagged the over all title "Miss Saffola Oats Queen 2011" and was crowned by the renowned cooks Mrs. Mallika Badrinath and Chef Damodaran. 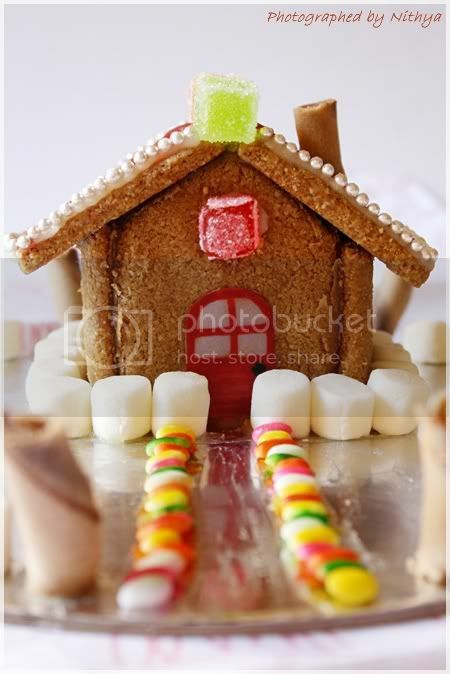 I made this oats cookie house for decoration and this center piece was the special attraction to my entry. Grind the oats and brown sugar separately into a fine powder. Beat the butter and sugar in a bowl until it turns smooth and creamy. Mix the powdered oats, salt and all purpose flour together and gently stir in the flour mixture just until incorporated. Now flatten the dough into a smooth disk shape with your hand and wrap in plastic wrap. Chill the dough for 15 mins. Take out the dough and pinch off equal little bits of dough and roll them into smooth balls. Press them a little flat with your palm. 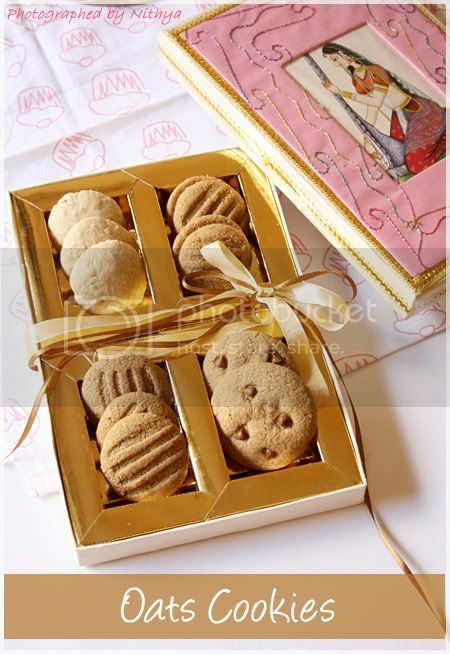 Now dip a fork in flour and press it slightly on the biscuits to get the tine marks on top giving it a decorative look. Place them on lined baking trays. Oats has the ability to puff up hence remember to leave enough space between each other when you place them on the tray. Place the tray with cookies and bake for 15-20 minutes, watching closely so that they don’t get too brown. 18 minutes did is perfectly in my convection oven. This quantity would make 15 medium sized cookies. I made 4 variations of oats cookies for the contest. * Added chocolate chips and chopped raisins to the dough and made cookies. 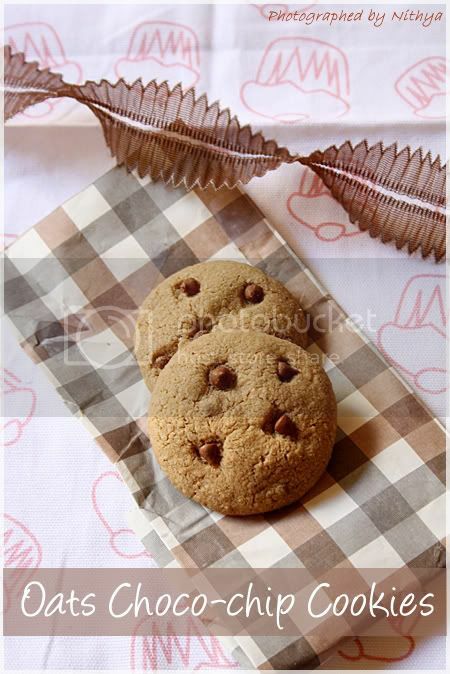 * Sandwiched two cookies by applying melted chocolate or chocolate butter cream or nutella and made creamed cookies. Congrats Nithi,happy for you! You deserve this,love the slogan,indeed a moment to feel proud!! Keep going! Congrats and you deserve it. Congrats dear, so well presented and such creative work, well deserved. Congratz dear, u truly deserve everything..Lovely slogan and that house looks damn pretty..Keep rocking dear..
Congrats Nithya!!! You truely deserve it!!! Congrats Nithya ... what a lovely slogan ... The cookies n the house looks truly out of this world ... Keep it up !! wow, congrats Nithya..Very Happy for you. Congratulations Nithya! Keep up the great work. The cookies and the house , both look so good. Congrats Nithya. Cookies and the house are amazing..
Congrats Nithi. You deserve and you are expert in all categories. The pictures, creativity and slogan writing all are great. The house is too good. May this year give you all you deserve. Congrads Nithi! Enjoy the Moment! Wish you many more Success!! Congratulation Nits.. U are simply amazing... Love the wonderful work u have done and I really appreciate it... SUPER..
Hearty Congratulations for this win. lovely house you made with oats. Congrats Nithi..you truley deserve this...pics are brilliant ! Good show.. and keep them all coming in! congratulations Nithya !! rocking way to start the new year :-) the cookies are looking just fantastic! Congrats Nithya for your wonderful feat. You truly deserve this and many such awards. Congrats Nithya..what a wonderful news! 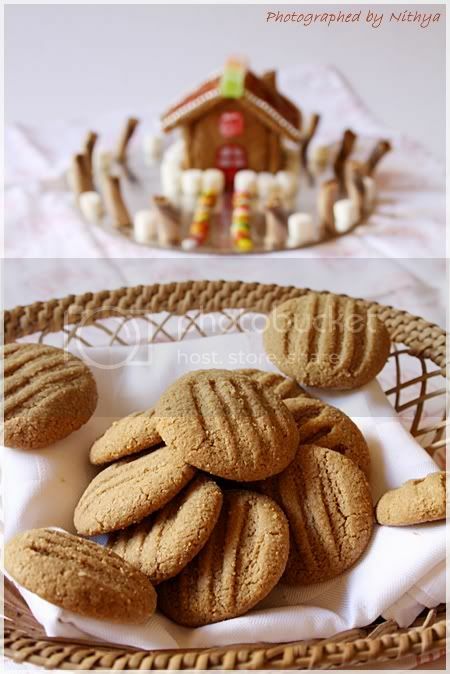 !The oats house looks so pretty..I am going to try out the cookies!! Congrats Nithya :) Truly its wonderful moment !!! Keep going. Congrats Nithya, good work keep it up. Congrats dear ...You deserve it ..
Congratulations Nithya! So happy for you! Congrats Nithya! Lovely slogan and oats cookie house! Congrats Nithya,cookies and the house look fabulous. Congratulations, Nithya..You really, really deserved it!! Loved your slogan and the cookie house!! Pictures are fabulous!! CONGRATULATIONS NITHYA! 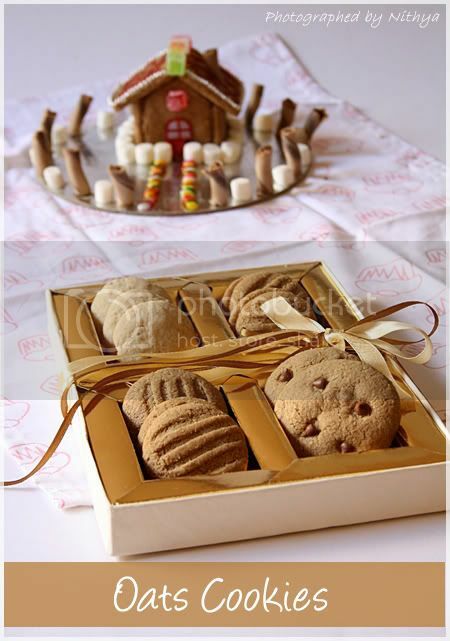 !You very well deserved it..Loved the slogan and cookies and the cookie house.. Congratulations..Loved your slogan and the cookie house!! Pictures are fabulous!! Very happy for you... Truly deserved win! Great job nithi!!! Proud of u! Its a grand opening of the new year. Hope this year will bring all fortune for you! So glad and happy for your win..let me rename u "Miss Talent Queen"
congrats nits u deserve girl !! yay !! wonderful slogan too , n obviously beautiful cookies ! Way to go gurl !! Congarts Nithya. 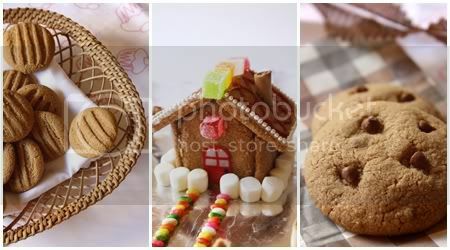 Cookies, house and veggie carving looks realy creative..
Congrats on winning the contest..u truly deserve it..the cookies look so good and inviting. congrats Nithi!!!! So happy for You!!! Everything looks great!!!! Cookie House is Beautiful and innovative!!!! slogan superb!!!! I m going to try your cookies this week!!!! Keep Rocking Girl!!!!! I'm in love with your blog! So many awesome pics and good recipes! Love those cookies! CONGRATS NITHI...U DESERVE THIS...AND WISHING YOU MANY MANY MANY MORE SUCCESS..! 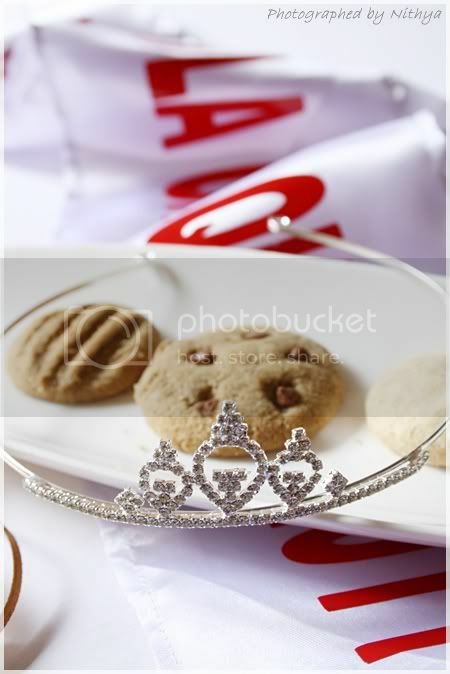 Oats cookies sounds irresistable with fascinating clicks..
Congrats & Best wishes, Nithya! Congratulations Nithi..You truly deserve this award and many more..Really very happy for you! 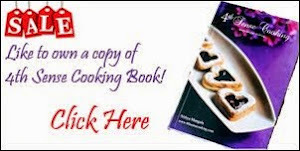 !Keep rocking, keep clicking and keep cooking!! Congrats Nithya! You have really accomplished a lot at a very young age. Keep going and I am sure you will achieve much more! Congratulations. Truly Well deserved. Hope many many more laurels and awards and tv shows come your way. I want to sit here in the US and watch you cook something in a tv show on Sun tv! Make it happen soon. Congratulations well done and well deserved. such a butiful post ! n lovely cookies ! could almost smell them ! :) first time on ur blog..I would be a regular from now on ! congrats on ur achievement !